The Echinoblog: Are Sea Urchins One Big Compound Eye?? 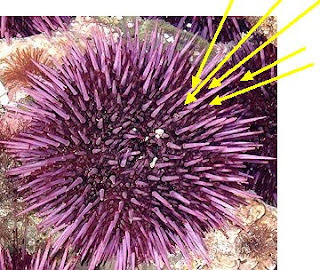 Are Sea Urchins One Big Compound Eye?? WHAT? How can sea urchins...SEE? They don't got a head. 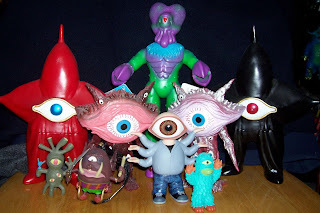 And they don't got eyes! There are two terrific papers by Sonke Johnsen at Duke University in the Journal of Experimental Biology! 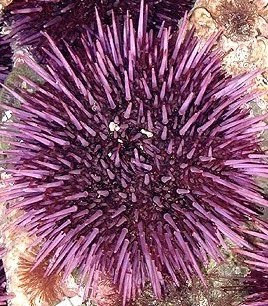 One by Blevins & Johnsen on the tropical sea urchin Echinometra and a recent one by Yerramilli and Johnsen on the purple sea urchin Strongylocentrotus which explores vision in these two species! First, How did they test for vision in something that looks like a big, spiny purple ball?? They ran a series of experiments in this clever apparatus! Basically, the urchin is put into a big tank and light from a light box is emitted from the top. The number of times and direction of the urchin relative to the tiny dark target were then recorded and calculated. So, there was experimental rigor and statistical analysis of the data to show that a pattern was present rather then random actions. Based on the number of times the animal responded, whether via moving away or towards the target-it did so regularly and consistently. S. purpuratus doesn't do well with smaller targets (e.g., 6.5 degrees) so 10 degrees is probably the lower limit of what this species can perceive. What's really cool is that the reaction of the animal to light seems largely tied to the spines. Closer examination of the pedicellariae (stalked pincer-like structures on the surface) and the test (i.e., the endoskeleton) revealed no evidence of the ability to register light. Spacing of the spines can actually affect the ability of the animal to recognize targets...and the higher the density of spines, the greater the "spatial visual resolution"! The visual acuity of S. purpuratus is roughly equal to that of the chambered (Nautilus)and the horseshoe crab (Limulus) but is still pretty weak relative to the vertebrate eye. Is there a consensus among those that study echinoids as to how the spines evolved, i.e, did the spines evolved as a defense mechanism, sensory apparatus, or some other function? I think that depends. 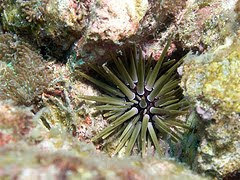 The modified spines in several of the irregular sea urchins, such as sand dollars and sea biscuits are often interpreted as adaptations to burrowing and so forth. 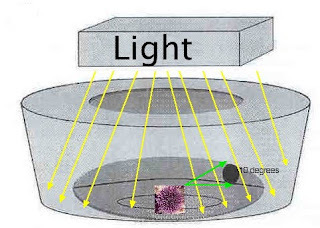 Based on what the paper sez, the urchins can distinguish size of the target disk in the tank.Reacting by moving toward or away from it under constant illumination conditions. And only when the disk is a specific, large size. I am not a specialist in optical physics or animal behavior but it seems to me that if it was photoreception, the response would be in direct response to light intensity. You seem to know a thing or two about it..I encourage you to click on the paper links! The Strongylocentrotus paper has a nice summary on the JEB site. Are those toys in the first picture Paira aliens? If so, where did you get them because I must have them. From Message from Space. Yes. they are. is that what they are called? The Japanese company Marmit makes them. They turn up on ebay or on other Godzilla-type vinyl related sites... definitely on Yahoo Japan. That's what I've seen them referred to, since I guess the planet they're from is called Paira. 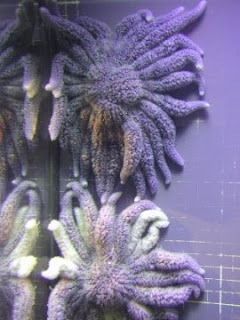 Thanks for the info, seeing these things made my day :D (not to mention the fabulous creepiness that are basket stars). huh...I remember that the purple urchins always seemed to be sensitive to light. 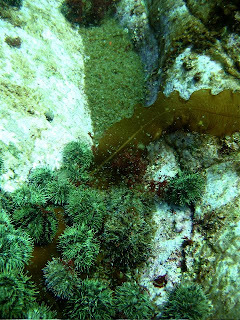 Maybe that's one reason why they seem to hold on to large pieces of algae during low tide... to "shade" their "eyes"???? lots of urchins cover themselves in debris..possibly for protection, etc. 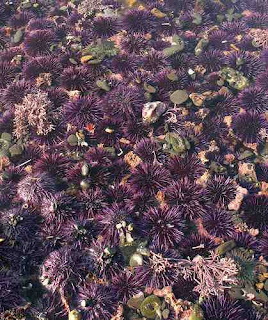 If it was kelp-could also be just for food... urchins are pretty photosensitive though..hard to say.